Businesses in India are being buffeted with grim head-winds on many fronts. Innovation is the need of the hour to achieve profitable growth in such a difficult environment. 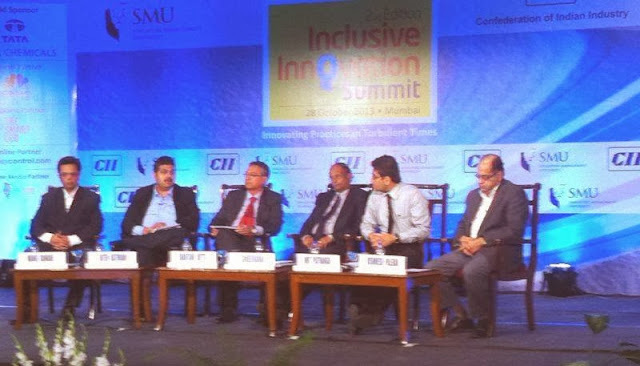 Confederation of Indian Industry (CII) partnered with Singapore Management University (SMU) to organize the 2nd edition of Inclusive Innovation Summit based on the theme 'Innovating Practices in Turbulent Times' on 28th October 2013 at Vivanta by Taj President, Mumbai. 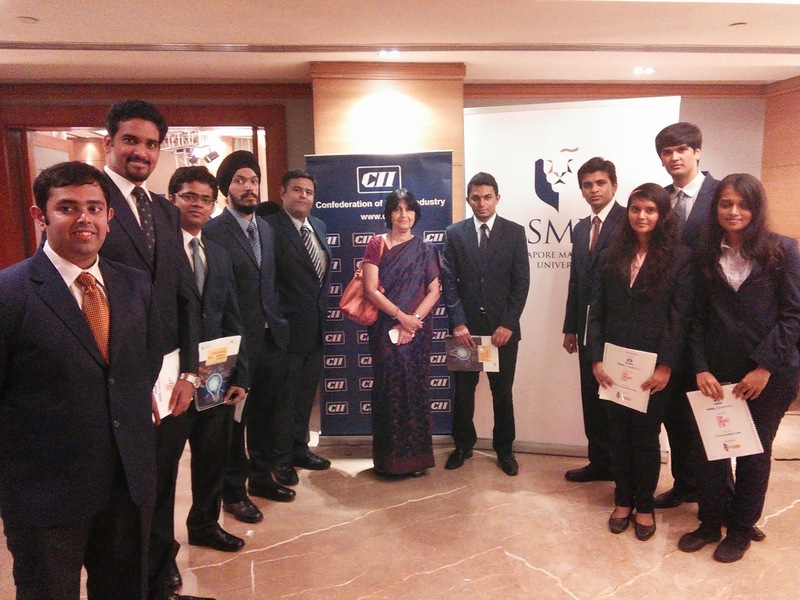 11 SIMSREE students accompanied by Prof. Sangeeta Pandit attended this conference. The seminar was inaugurated by Mr. Ninad Karpe (Chairman, CII Maharashtra State Council) who welcomed the speakers and the audience. 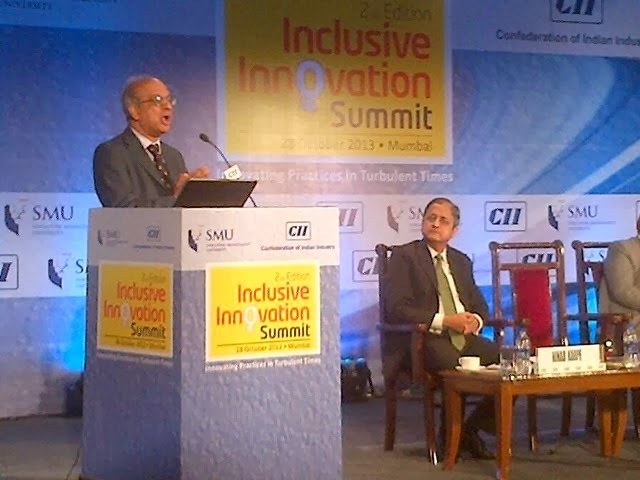 This session included a speech by Mr. R Mukundan (Chairman, CII Western Region & Managing Director, Tata Chemicals Ltd.) emphasizing on affirmative inclusivity, a presentation by Professor Rajendra Srivastava (Provost & Deputy President, SMU), an addressal by Mr. Madhukar Sabnavis (Vice Chairman & Country Head, Ogilvy & Mather Pvt. Ltd.) which included many interesting audio-visuals. The inaugural address was delivered by Mr. Jayant Kumar Banthia (Chief Secretary, Government of Maharashtra) who mentioned about the challenges faced and innovations undertaken by the government. The pre-lunch session was divided into two sub-sessions. 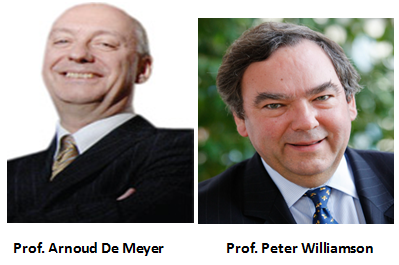 The first sub-session had a live video conference from Singapore addressed by Professor Arnoud De Meyer and Professor Peter Williamson from Singapore Management University (SMU). It was moderated by Professor Rajendra Srivastava. 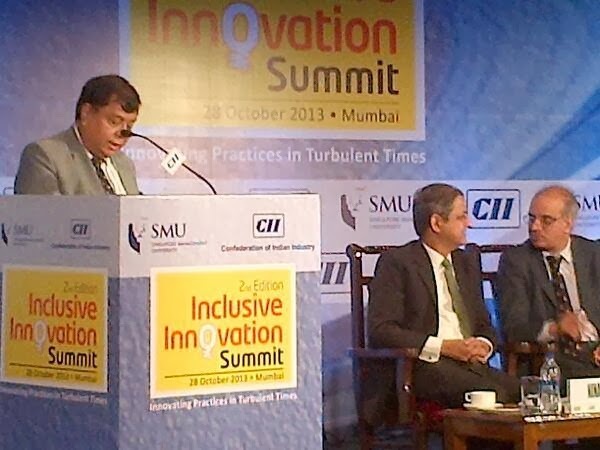 The theme of this session was 'Leveraging the Asian Innovation Environment'. It focused on the growing importance of innovation in Asia and the possibilities for companies to take advantage of the highly dynamic innovation environment. Using China as a case study, the session looked at ways in which Asian companies are approaching the challenge of ramping up innovation on the basis of re-innovation and by industrializing research and development. The topic of the second sub-session was 'Business Model Innovation-Lessons from the East and West'. Mr. Srivastava opened the topic with a wonderful comparison between an expensive French restaurant and an inexpensive Chinese restaurant and explaining the DuPont model. The key take-away's from this session included creating values for customers first and then thinking about extracting values, the need to invest in the right combination of assets which includes tangible as well as intangible assets and the opportunity cost of not doing business model innovations. It is important to innovate your business model and improve its reach to all sets of customers. The post lunch session included two panel discussions. The topic for the first panel discussion was 'Connecting the Last Mile'. The panel included Mr. G Sunderraman (Executive Vice President, Godrej & Boyce Ltd.), Mr. Manoj Dawane (Vice President, Ericson India), Mr. Vishwesh Palekar (Senior Vice President, Mahindra and Mahindra Ltd.), Mr. Amit Paithankar (Managing Director, Emerson Process Manaement) and Mr. Biten Kathrani (Director Enrichment & IP, Johnson & Johnson Ltd.). 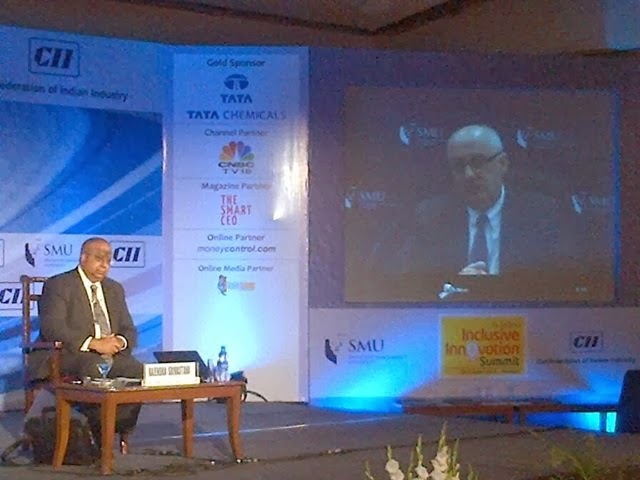 Professor Shantanu Dutta from Singapore Management University (SMU) moderated this panel discussion. This panel discussion brought together leaders from the various fields to discuss the challenges they faced to bridge the gap between developing ideas and increased product development. The topic for the second panel discussion was 'Milking the Cows'. The panel included Dr. Ranjan Banerjee (CEO, Renaissance Strategic Consultants & Visiting Professor, Carlson School of Management), Mr. Kannan Tinnium (Technology Leader, GE Global Researh), Mr. Tarun Agarwal (Head- Alternate Channels, Products & Innovations, Development Banking and Financial Inclusion Group, Ratnakar Bank Limited) and Ms. Nilima Achwal (Executive Producer, Villgro's SEED). Professor Srinivas Reddy from SIngapore Management University (SMU) moderated this panel discussion. This session voiced the views and perspectives of the panelists on ways to cultivate the culture of innovation by encouraging and tapping the entrepreneurial spirit of the employees. The last session, 'Lessons from Hidden Gems' was dedicated to entrepreneurs who did not succumb to the economic meltdown. This daring group of individuals included Mr. Mahesh Murthy (Founder & CEO, Pinstorm), Mr. Paresh Rajde (Founder & Chairman, Suvidhaa Infoservice P. Ltd.) and Ms. Sweta Mangal (Co-founder & CEO, Ziqitza Health Care Limited). They shared about how they remained undettered by all the obstacles in their path to succeed in their venture and to make the world a better place to live in. Professor Rajendra Srivastava was the session chairman and delivered the concluding remarks by thanking CII, all the panelists of the day and the sponsors. The key take-away from the summit was learnings from our Asian neighbours like China, Korea, Japan etc., about how they are moving up the rising curve and the innovation models that they use. The panelists during the Q & A round provided a glimmer of hope and a shinning example of what can be done by us and the business models that we can adopt for inclusive innovation. 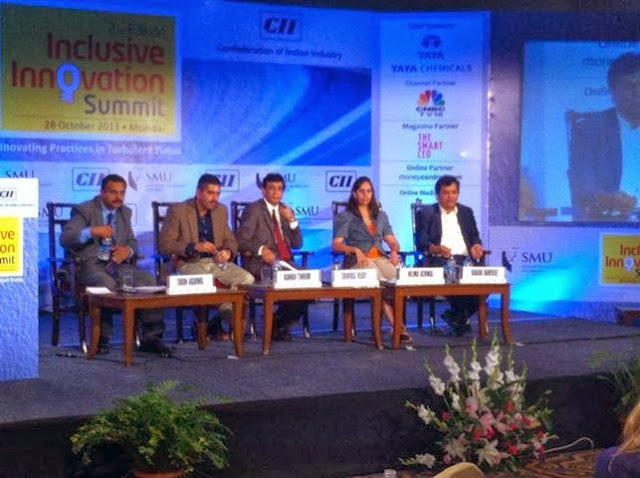 All in all, the 2nd edition of Inclusive Innovation Summit was a grand success and we hope to get many more similar opportunities in future as it gives us tremendous industry exposure which is quintessential in today's competitive environment.